Today, Shimano has announced a new mount standard for road disc brakes called Flat Mount. This new mounting option has been developed by Shimano in close cooperation with leading road bike brands as a dedicated “on road” solution. This new design allows bike manufacturers to move away from the mountain bike history and looks that has been used up to this point. Inb4 (deleted) who’ve never used brakes that actually work whining about how they’re not needed on road bikes. I guess we’ll have to wait until more info comes out, but how do you account for different size rotors? Hum.. Let’s see by the looks of it.. It’s attached to the frame on the inside… So more chances of stripping threads when adjusting.. Also.. Once stripped… Hum frame has to be replaced… I’d say that’s planned obsolescence. Also, where’s the adjustability to use after market stuff so that your not just using shimano’s stuff… I think there’s enough said… Hope this is not another standard because shimano thinks it’s a good idea..
@Derek, with an adapter of course! Yet another, unique adapter.. Pretty soon we will walk into a bike shop, tell them what we want, and wait for them to invent something, err, different. You will never need spare parts, just chuck it when you get bored and rinse/repeat. HAH! Hayes called, said they’ve already done this. Can we start using quote marks around “standard” when it’s just a mfr’s proprietary bullsh*t? It reminds me a bit of the old 22mm standard Hayes originally used. Leave it to Shimano to cram another “standard” down our throats and force us to use something we don’t want. Post mounts have worked great for years. There is no point to move away from mtb just for the sake of moving away from proven mtb technology. Thanks, Shimano! This is super exciting. a cleaner mount will open up the possibilities for more aero setups because they will better align with the frame and fork. Definitely opens the door for some cool new performance products. Flat mount. Twin Post Mount. Who needs it. I am holding out for a super conductor mount that will allow the caliper to pivot independently. NEVER need to adjust as it will just morph to every nuance in your rotor. It will be so awesome. Yes….I am joking. And yes…..I LOVE disc braking. My post mounts work just fine Shimano. How about you push the envelope rather than just slide it laterally. Good grief. They NEVER learn do they? Shall we write a list of failed Shimano “standards”? this is bad news for you if you’re gonna buy a frame in the next, what 3yrs? if your sled is fine why do you care? are ya gonna go next level on strava and these’ll stand in your way? This is stupid, post is the way front and rear. Am I the only one that thinks a 160mm front rotor on road bike is to small? Ten bucks says shimano wins and that top manus follow suit. I could care less about road discs until we can race with them. It will be sweet though once all the bugs and standards are ironed out. Can’t argue agains Tron like braking precision on the road. The worst racing issue will be big packs with a mix of disc and rim calipers. Yeah posts mounts work just fine… blah blah blah, they also aren’t that aero, and heavier than they need to be. Sure it’s another ‘standard’ but hardly anyone has Disc equipped road bikes yet so it’s not like this is affecting many people. Shimano has proven that they make the best brakes in the industry by a clear and obvious margin, and giving them the benefit of the doubt (considering this fact) seems fair. I for one applaud the dedication to make a change BEFORE the majority own the ‘old standard’. As for ridiculous statements like “Once stripped… Hum frame has to be replaced”, that’s how it already is with post mount. They already own the road disc market (thanks to Sram’s incompetence) so how can this be viewed as a marketing ploy? if anything they are running a risk by trying something new. Yes it’s a new standard, but both my disc brake bikes already use adapters at one end or another, so I don’t see problem. Just get the right one for your setup. One of the last gripes by the anti-DB crowd for road bikes is the aerodynamics of the calipers. If this solves that issue, as long as you’re running ‘aero’ version calipers sans adapter, then I’m all for it. I seriously hope this standard includes replaceable threads (ie threads in lateral inserts like on Turner MTB’s etc). Also can we get a ban for Bobby @ 5:55pm, what a pathetic useless comment. The majority of posts on here are probably coming from mountain bikers that don’t quite appreciate the nuances in road bike design. Disc-brake calipers have always looked gawd-awful on road bikes because they look tacked on. Simple as that. They always look like an ugly afterthought. But if you look at Dura-Ace standard calipers, they are very fluid and effeminate. The proportions are lighter and more svelte. By proposing this new low-profile standard for disc-brake calipers, Shimano is opening the door to finally offering brakes that actually look fitting on a bike that only weighs 12 lbs and isn’t meant to be barreling down a rocky path. SRAM has that part covered!! And this is different from current side pull calipers how exactly?? Unless you’re in the distinct minority of people who either own one of the newer aero frames or a 50+ year old constructeur bike chances are your brake calipers are tacked on with a single mounting bolt instead of being integrated into the frame. Only difference is it’s a look we’re used to thanks to 50 years of tradition. As for aero brakes, if you think that actually makes a difference in the real world you’re a fool. Despite 50 years of aero advancements the average speed of the Tour de France has hardly changed (and keep in mind the Tour was much longer 50 years ago and still included a lot of dirt roads!) Sure, aerodynamics come into play during time trials but even then the vast majority of the gains come from rider position and wheels. End of the day it still comes down to the rider. Some of these comments need a ‘like’ button. Being backwards compatible with post mount frames and forks should mean there’s nothing for roadies with post mount forks and frames to complain about. I was about to throw a fit until the last point of being backward compatible. Don’t say this too often, but thank you Shimano. Up to that point I only saw this as a money grab by some what forced change. Will this make wheel changes easier? This is much bigger than Shimano introducing a new standard. 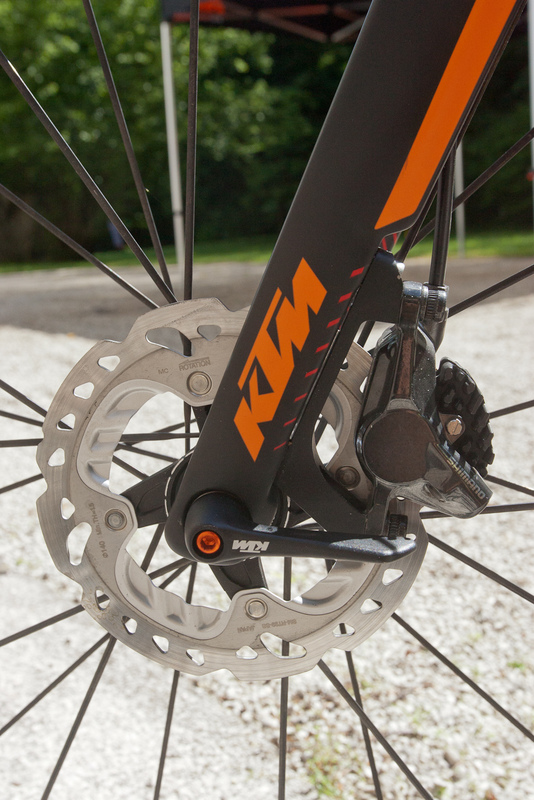 In order for road disk brakes to be adopted by pro teams and the UCI there needs to be a very clearly defined standard that all frame, brake and hub manufacturers adopt to facilitate quick road side wheel changes. It makes sense that Shimano, the largest component manufacturer working with leading road bike brands, would develope the standard. There is nothing wrong with post mount brakes except every frame, brake, adaptor and hub is different, making wheel changes too time consuming for the pro tour and too difficult for neutral support. Great. I was holding off until next year for manufacturers to release disc-equipped road bikes that fit my budget. Now the 2015 models are instantly obsolete once 2016 comes around. Sigh. Road bikes don’t need disc brakes anyway. Seeing this actually pissed me off. Dumb. Just dumb. First rule of businesses: NEVER miss an opportunity to f**k up consumers with +1 standard that does nothing, in the name of money. Err I mean, MTBs had the position wrong ALL along this model is so REVOLUTIONARY. lol. Hope you realize that after a year frames wont ship adapters anymore, and the brakes you’ll buy from shimano also wont ship with adapters. Now if only they could find a way to force you into a new rotor every few years thatd be perfect. its going to be super sweet and everyone will want them. just you wait. l do!! I think any bicycle engineer who invents a new standard should be sentenced to 3 years in prison. I’d like to see a show of hands from everyone that’s posted, that owns a road bike equipped with disc brakes. 2 or 3, maybe? Ya know, there’s always Cycleexif, for all the traditionalists, and if you’ve only got a MTB, then there’s Pinkbike. Please, a few comments on the design, not on your own unwillingness to accept change, or your empty wallet. It looks like the calipers are mounted inline with the dropout, front and rear, simplifying wheel installation. The stripped threads argument bears no weight; there is a possibility of stripping any threaded interface. That’s the inherent weakness of threads. Just going out on a limb, and guessing we’ll see these mounts on a new Trek model(read: HIGH END). Disk on road is not needed but amazing all the same. @ES: I laughed in your general direction. “Nuances” of design? You mean overpriced luddite garbage sold under the guise of “tradition”? My guess is that mountain frames will follow. Getting the mounts right next to frame elements should provide better aerodynamics. As to the “standard” however, it’s not a standard until it’s adopted by everyone. Granted, it’s Shimano, but as pointed out earlier, they’ve failed at introducing “standards” before. Nonetheless, MTB systems and road systems are and should be different – while the main elements work the same, most of the secondary priorities are different. I am bathing in irony by lamenting the constant creation of unnecessary standards and technological progression in the biking industry while driving around in a late-model BMW, and not a horse-drawn carriage. You can see the “new” standart (so it was released by Shimano a long time ago!). KTM PM said that the new caliper are to come 2016!!!! In my option it looks ugly with old caliper and I was wondering how it looks with 160mm rotor. I will buy a road racer with disc but I will wait to get “standards” for hubs, brakes and axles. This makes it easy to manufacture frames that will look good and function well with rim OR with disc brakes. Simplifies logistics and reduces stock. Upgrading to disc or downgrading to rimbrakes becomes an option, and future proofing a purchase the next few years as the technology develops. Like the interface or not, what struck me most is that there’s almost no information about the new stuff. That one grainy CAD image doesn’t provide more than a hint how it’s done, especially the rear end. That caliper could also just be hanging in the air there…. If you acknowledge that road and mtb bikes have different requirements, then it’s only natural to have different solutions. Maybe post-mount brakes from mtb are not so appropriate for road bikes, especially wheel changing in road races and aesthetics. And why would Shimano keep this proprietary. What’s “proprietary” in this solution? I don’t see anything. And for now, road disc brakes are in infancy. bottom line. i won’t buy it. don’t see the problem. motorcycle companies don’t just bolt on the same brake from a motocross bike to their street touring bike, why should bicycles be any different? Mike nailed it when he brings up helicoils. Honestly, I’m amazed at some of the people who call themselves bike mechanics these days. They really should just call themselves parts installers since so many seem to be lacking even the most basic understanding of how things actually work. I’ve lost track of the number of “professional” bike mechanics who say you can’t repair a carbon frame (not true), can’t calculate spoke length without the use of software, say aluminum is stiffer than steel (factually incorrect), etc. This is pretty basic stuff. I can get someone not knowing how to overhaul a Jubilee derailleur or set up Delta brakes but a lot of people working in shops these days seem incapable of doing much beyond installing/tuning parts. @shafty, Threads aren’t weak, but threaded joint designs often are. In a properly designed joint the male thread (bolt) should fail before the female thread. The idea is you replace a cheap fastener, not the expensive component (or deal with the hell of a helicoil). Match the materials and length of engagement and you’re GTG. See Federal Std. H28. Of course it remains to be seen what sort of interface we’re dealing with here. As others have said, based on one funky picture, there may not be anything holding it on right now. I don’t think the current “MTB” style mounting method is exactly optimized so I’ll wait and see what Shimano brings before judging. Methinks much of the backlash has to do with frustration over the word “standard”. Chris is right. I’ve retapped / threaded bottle cage bosses, seat post binders, bottom brackets and cleat receivers on shoes. I see no real difference here. I mean seriously, you can strip the post mounts on your current disc frame, too, and then where are you? you don’t like it, fine, go buy an old Cannondale or LeMond with a quill stem and square taper BB off craigslist for $200 – there are literally thousands of them out there to be had. No one is holding a gun to your head and forcing you to buy new tech. Plus I hear custom builders do a lot of nice retro stuff too, if you’re in the market for high end obsolescence. I would think a system like this offers flexibility for manufacturers wanting to hedge bets or split the difference between frames with rim brake mounts vs. disc mounts, such as we saw with the Hayes systems fifteen years ago, and are still seeing to this day with new frames that are set up for electronic vs. mechanical shifting systems. This sort of flush mount does have the potential to be lighter and more aero, and easier to align with the dropout. Plenty of innovation has proven itself valuable. Plenty also (Biopace, CODA cranks, Taperbore) not so much. Ultimately manufacturers and the market will dictate what works and what doesn’t, so in that way I do agree it’s silly to call a prototype tech like this a “standard” until it’s proven. I think the biggest issue is that Shimano already has a ‘standard’ and has decided to introduce something new. If they were THAT keen, they would have done it up front because, as been mentioned already a million times, road bikes don’t have discs right now, so anything goes. I fail to see the point of developing something and putting it out there in a virgin market, getting builders/brands on board and then changing it mid flight. Do it once and do it right… but that’s just me. Wow, lonefrontranger burned almost all of you quite successfully. Well said. Don’t called a standard what is really a format. Standards do not exist in cycling. That said I have nothing against it. Looks like it wouldn’t be hard to have post mount adapters for backward compatibility. Just to correct Chris’ statement that the tour average speeds have not increased much over time: the average speed pre-1950 was just a touch over 15mph and now averages over 25mph. I’d say that is a huge difference. Now aero hasn’t played much into that, but still to assert there has been little change is absurd. Depending on the way it mounts to the frame this could be awesome. Look at current options for road bikes.. Cannondale reach around? come on. Even standard post mounts on road bikes aren’t perfect. If you ride smaller than 52 good luck getting a wrench into the rear. Luckily manufacturing standards are better, but you ever try to face those things? I rejoice for innovation. Just cause it ain’t broke doesn’t mean it can’t get better. @lonefrontranger: First off, I agree with 99% of what you said. I am often amazed at the education that many of the young lackies working in bike shops get in order to sell stuff, but the average consumer doesn’t need to know the level of detail of season veterans of the sport. I do want a mechanic that knows he can rebuild my Campy shifters (assuming I’m too busy to do it myself), and knows how to build a wheel. It takes practice, and a desire to learn. Its also disappointing when a salesperson has never ridden anything other than carbon, and they tell you “how great it rides” and all the other buzz words they are taught. I have steel bikes that ride better than most carbon bikes I own. They are more lively, and have a better character. I once had a kid tell me that the only way to go was carbon, but he’s never ridden Ti, good steel, or even a well designed aluminum bike. My only disagreement is that I am not sure what you mean by CODA cranks. If you are referring to the Magic Motorcycle (later branded CODA) cranks, they were the first to do an outboard bearing and also the first splined interface between BB Spindle and crankarm. They also gave way to the Hollowgram cranksets, which have historically tested as the best combination between lightness and stiffness available on the market.. This in-turn opened the door to the much loathed BB30 bottom bracket design. While you may not agree with it, it was innovative and has changed the way cranksets are designed today. I agree with @KevinfromVA; you are exactly correct. It may not be broken, but it can get better. @Trevor – I don’t disagree with the innovation on the interface; perhaps I should have clarified. What I meant was that 90% of the CODAs I saw broke. One split apart in the midst of a MTB race and left a 3″ long gash in my friend’s leg. Perhaps I should have said “Trek Y-foil designs” instead. @lonefrontranger – Don’t disagree, and totally fair. Not to worry, I wasn’t riding when that stuff was happening, and wasn’t exposed to the issues you speak of. And issues that cause injuries are even worse; sorry to hear about your friends leg. I think that the drive to gain more consistency and standardize across the industry is a good thing, but two people, based on experiences can have totally different solutions for the same problem. Is one wrong and the other right? not necessarily, just different ways to solve the same problem. innovation and change is definitely a big driving factor in the industry. Just take the Trek Domane and the Cannondale Synapse for “mainstream” examples. They both are trying to take the edge off the rear end for longer rides, one does it in the seat tube joint, the other in the stays. both work exceptionally well from what I’ve been able to discern; just different approaches. I appreciate companies that do things for a specific reason, and don’t fall into the “flavor of the week” in the industry. This seems oddly similar to the old 22mm mounts. Remember-through axles are a frame part, not a wheel part. if they have the same rotor/cassette any wheel can go in any bike – makes it simple for neutral spares at le tour. The rider already has his axle – 90 degree twist axles will make this quiker than lawyer tabbbed skewer changes. Does anyone know any manufactures are making this kind of frame for this? Yes, Taiwaneese OEM Greatgo cycles // Trigon bikes will come up with a latest of art TR636 road racing bike with Shimano flat mount brakes soon.